"Until now, nobody had a clue the two other rings were there..."
Hubble Space Telescope images credit: NASA, ESA, and M. Showalter, SETI Institute. 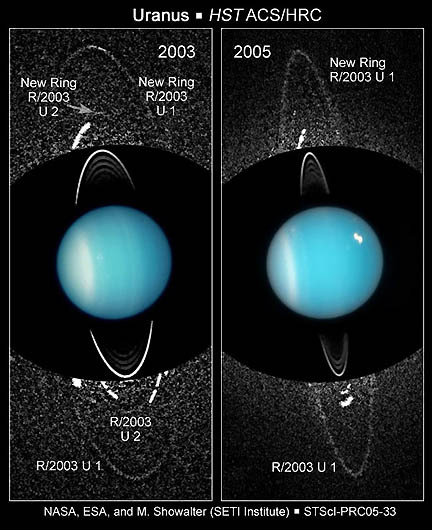 December 23, 2005 Baltimore, Maryland - Hubble researchers report: "These composite images from several observations by NASA's Hubble Space Telescope reveal a pair of newly discovered rings encircling the planet Uranus. The left composite image is made from Hubble images taken in 2003. The new dusty rings are extremely faint and required long exposures to capture their image. The background speckle pattern is noise in the image. The outermost ring (R/2003 U 1) is likely replenished by dust blasted off a newly discovered satellite called Mab, embedded in the ring and visible as a bright streak at the top of the outer ring. The new outermost ring is twice the radius of the previously known ring system around Uranus, as seen near image center. (The inner rings are much brighter, so no noise is visible in the background). Approximately halfway between the outermost ring and inner ring system is a second newly discovered ring (R/2003 U2). Only a faint segment of it appears at the 12:00 o'clock position. Because of the long exposures, the moons are smeared out and appear as arcs within the ring system.